HENRY GOODHIND was born on August 22, 1834 in Cullompton, Devonshire, England. Also known as ‘Harry,’ he married ELIZA BLEEZE (born at Bromley Heath, England on February 14, 1839) on May 31, 1857 at the Parish Church of Bexley, Kent. The couple entered the Port of New York on June 20, 1859 aboard the ship Rhine, eventually landing in Hartford, CT. Not only did Henry come with his own family, consisting of his wife, Eliza and their 18 month old son, Henry, but also with them was FREDERICK, Henry’s brother, and his young bride of two weeks, ELIZA (née MARTIN). According to her death certificate, ELIZA (née BLEEZE) GOODHIND was born at Bromley Heath, England on February 14, 1839, and died in Housatonic, MA (a village of Great Barrington) on June 5, 1928; she was 89 years old. Henry became a naturalized citizen on July 21, 1882 at Superior Court, Berkshire County, Pittsfield, MA. He was a papermaker here in America, as he had been in England. There is a family tradition that the brothers brought with them a papermaking ‘recipe’ that proved very successful for them. Henry died on December 24, 1910 in Housatonic; he was 76 years old. Both he and Eliza are buried in Greenlawn Cemetery in Housatonic. A. HENRY C. GOODHIND, also known as Harry, was born November 28, 1857 in England. He was a papermaker, like his father. He married FANNY A. BREWER (born 1863 in Tyringham, MA) on October 30, 1880 in Great Barrington, MA. Harry became a naturalized citizen on Nov. 26, 1883 at Superior Court, Berkshire County, Pittsfield, MA. Henry moved to Connecticut some time after his marriage and was a papermaker, like his father. B. MARY ANN ("Molly") GOODHIND was born December 4, 1859 in Dalton (Aunt Rose had said Eliza had gone to stay with friends) and died in Springfield on February 6, 1953 at the age of 93. She married WILLIAM HENRY BROWN (born about 1858 in Stockport, Cheshire, England), who died January 3, 1936; he would have been 78 years old. They lived in Housatonic, just below her parents on the main road. They are both buried in Greenlawn Cemetery in Housatonic. a. MARY VIRGINA BROWN was born May 25, 1915 and died November 15, 2003 in Holland, MA; she was 88. She married FREDERICK HENKE (born April 22, 1916; died April 17, 2003 in Holland, MA. He was 86.). Five children. b. RICHARD BRADLEY BROWN was born June 24, 1919. He married IDA ISHERWOOD (born February 4, 1922 in St. Anne, England. After Richard's death, she re-married to CHARLES ALBRECHT, who passed away in 1989.) Richard died July 7, 1970 in Stafford, CT at 51 years of age, CT; Ida died April 25, 2010 in Union, CT at 88. One daughter. 1. MILDRED E GOODHIND was born on April 4, 1897 in Holyoke, MA. She died on August 16, 1897 at 4 months, 12 days old due to "malassimilation" (i.e. a failure of the gastrointestinal system to assimilate nutrients). 2. RUTH HOYT GOODHIND was born December 21, 1897 in Holyoke. 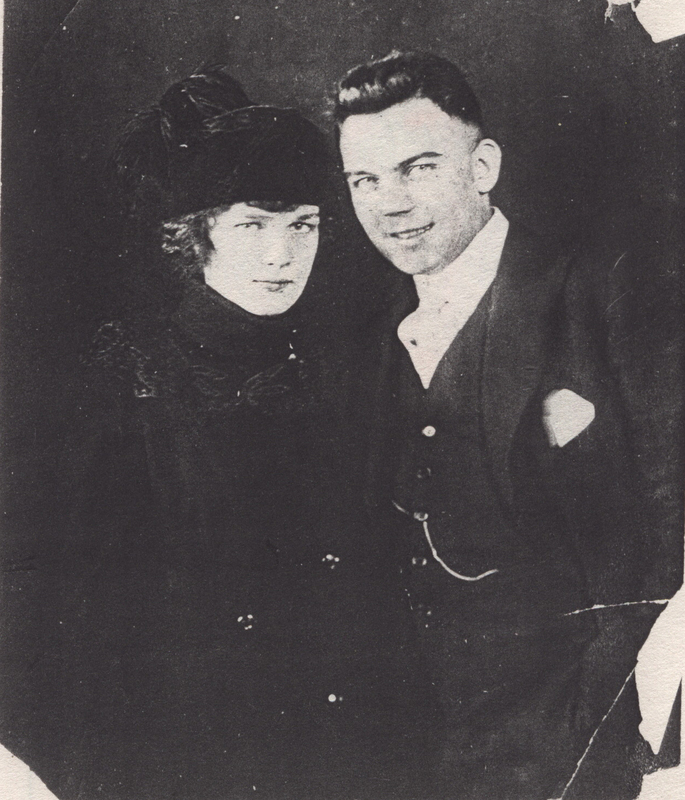 She married HARRY L. TRASK of Danvers, MA on July 8, 1918 in Spartanburg, SC. Harry died on August 20, 1971 in Manchester, CT at the age of 75. Ruth passed away in Windsor, Ct on July 18, 1998; she was 100 years old. 4. RACHEL MARTIN GOODHIND was born September 3, 1901 in West Springfield. She died in a convalescent home after a long illness on April 26, 1985 in West Springfield. She was 83. 1. LILLIAN AUGUSTA SNYDER was born on June 29, 1882 in Housatonic. She died in Great Barrington at 5 years old on February 19, 1888 due to cholera infantum. She is buried in Housatonic. 2. MAUDE L. SNYDER was born on January 1, 1885 in Housatonic; she died there on January 29, 1983 at the age of 98. She married ATWOOD AMOS GALLUP (born April 22, 1883 in Bulwer, Quebec, Canada) on August 31, 1909. In the 1920 federal census of Main Street, Great Barrington, we find Atwood working as an electrician for an Electric Light Station. a. WILLIAM SYNDER GALLUP was born on November 30, 1910 in Housatonic; he died on November 27, 1996 in Leesburg, FL at the age of 85. He married FRANCES H. SMITH (born June 2, 1910 in St, Albans, VT). Frances died on July 19, 1985 in Housatonic at the age of 75. 3. BELLE SNYDER was born on January 9, 1888 in Housatonic; she died there at 9 years old on May 6, 1897. She is buried in Greenlawn Cemetery in Housatonic.